When in the dental chair at your dentists office you may have noticed that the doctor, when making references to your teeth, does not call them by name but by number. To help you better understand which tooth is being referred to during your visit this chart may be handy to print out and take with you. 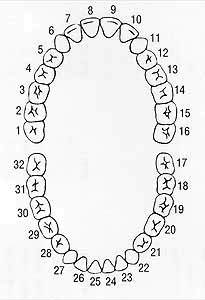 You can have the Doctor circle the tooth or teeth that he is checking or working on, The chart is pictured is as if you're facing your dentist and he/she has their mouth wide open. As seen from the chart, the first teeth begin to break through the gums at about 6 months of age. Usually, the first two teeth to erupt are the two bottom central incisors (the two bottom front teeth). Next, the top four front teeth emerge. After that, other teeth slowly begin to fill in, usually in pairs – one each side of the upper or lower jaw – until all 20 teeth (10 in the upper jaw and 10 in the lower jaw) have come in by the time the child is 2 ½ to 3 years old. The complete set of primary teeth is in the mouth from the age of 2 ½ to 3 years of age to 6 to 7 years of age. 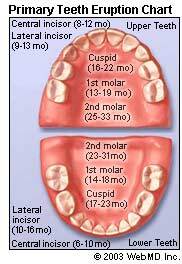 The chart to the right shows when permanent teeth emerge.